Congratulations to owner Rachel Van Allen and Quailhurst alumni horse “Caby” (Caletino x Tjinja) who very successfully participated in a three day clinic with legendary showjumping coach George Morris last weekend at Whip ‘n Spur in Wilsonville, Oregon. The pair demonstrated an easy, forward, and rhythmic relationship as Morris worked them on the flat without stirrups, over pole exercises, and courses. Rachel gave Caby a positive and confident ride over one of George’s favorite and most important exercises – water obstacles, including a liverpool and an open water fence – and the two looked as if they jump these difficult fences all the time. Deborah bred Caby in 2005 and rode him for the first three years. He is a twin to her competition dressage horse “Alexiss,” both sharing her great mare “Tjinja” as dam and Quailhurst stallion “Caletino” as sire. Both horses exhibit the phenomenal talent and nature of their parents and, though it is never easy to sell a horse (especially one with this much potential! ), it brings Deborah great joy to see Caby having the opportunity to excel at what he loves t0 do – jump! 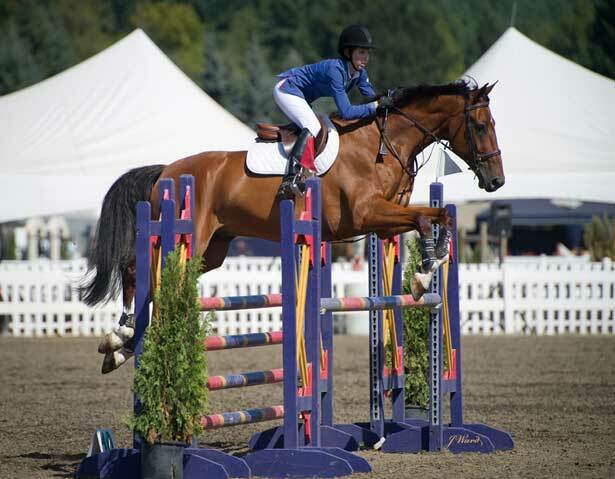 Rachel and Caby finished out the 2012 show Northwest show season as the Reserve Grand Circuit Champion in the High Children’s Jumpers and with a win $1000 Children/Adult Jumper Classic and a 2nd place finish in their first Platinum Performance/USEF Show Jumping Talent Search Medal.